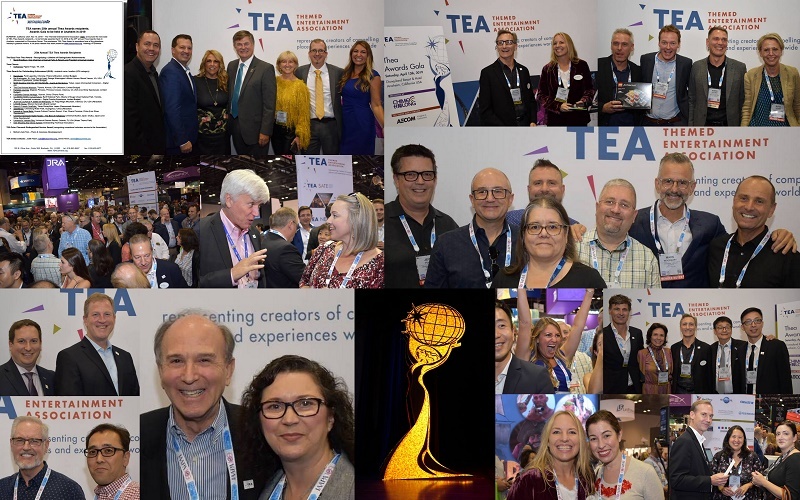 The Themed Entertainment Association (TEA) booth at IAAPA Orlando 2018 was continually busy throughout the four days of the Expo, providing a place for people to learn more about and join the association, make connections, catch up with colleagues, attend sponsored mixers and learn about the new slate of TEA Thea Awards recipients. 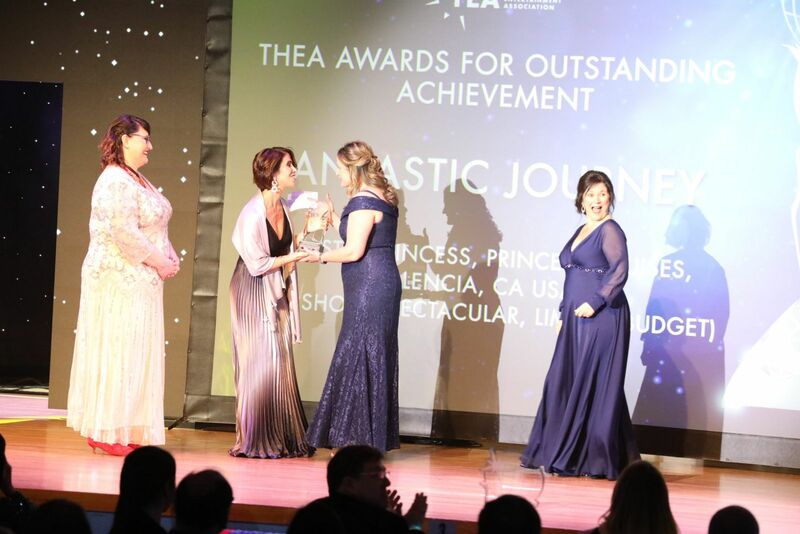 Above: The 25th annual TEA Thea Awards recipients were announced at the TEA booth, Nov 13, 2018 during the IAAPA Attractions Expo in Orlando. New TEA International Board President Michael Mercadante made the announcement - his first official act in his new role. Several of the recipients were on hand for photos and congratulations. 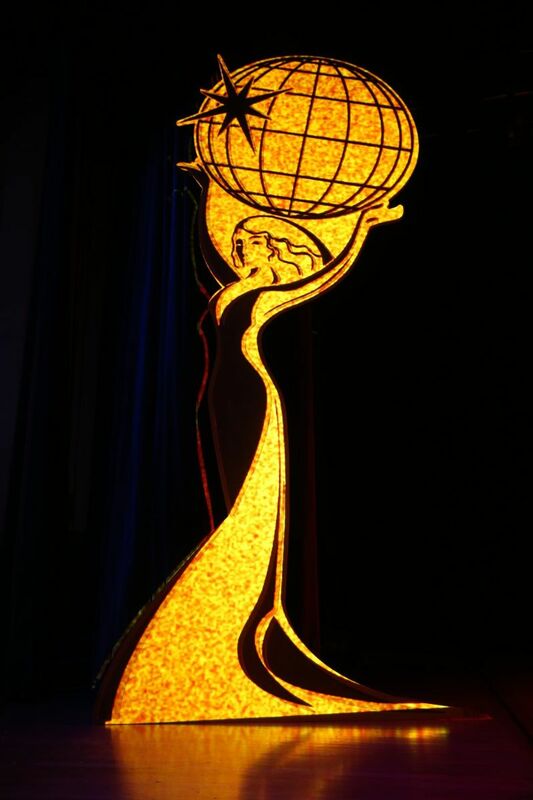 In 2019, the recipients will be showcased April 11-12 at the TEA Summit and Thea Case Studies, then formally awarded April 13 at the black-tie TEA Thea Awards Gala. Tickets will go on sale for the Summit and Theas weekend before the end of 2018. Photos for TEA by Martin Palicki. PHOTO GALLERY. OFFICIAL PRESS RELEASE & DESCRIPTIONS. In conjunction with this annual November Expo, TEA also holds its annual Members Meeting where new International and Division Board members officially take office while others finish their terms and are thanked for their service. 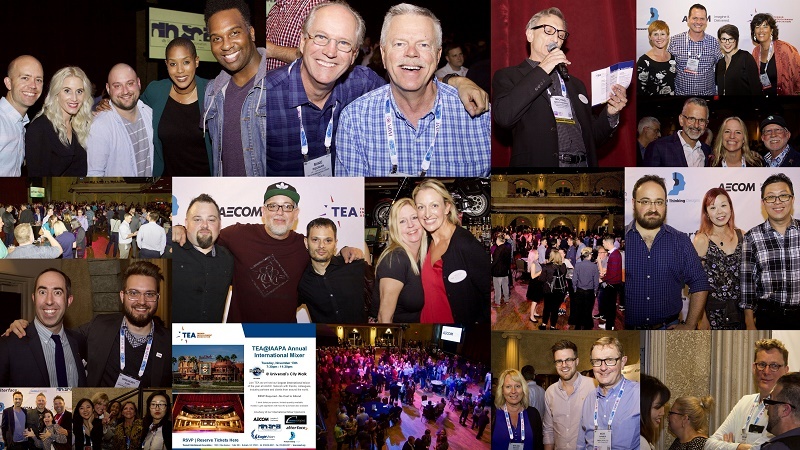 TEA also hosts its International Mixer, which this year drew some 2,000 attendees to Hard Rock Live at Universal CityWalk. 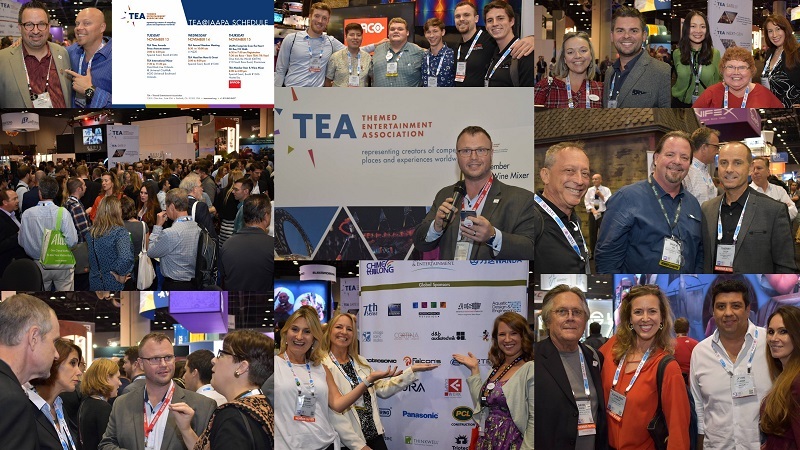 The support of TEA sponsors and partners and the contributions of volunteers working in cooperation with TEA staff are essential to the high caliber and success of the TEA presence at this IAAPA Expo as well as those in Europe and Asia, and we express heartfelt thanks and appreciation to them all. 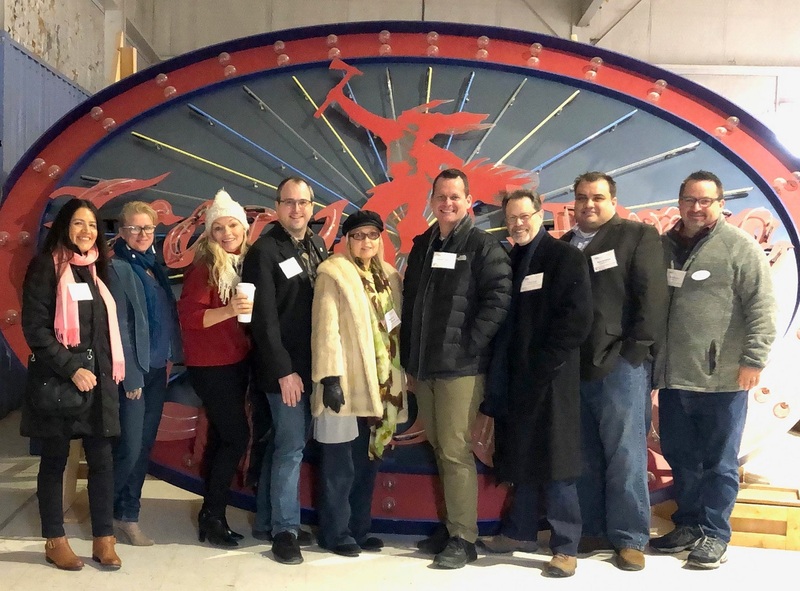 The annual Themed Entertainment Association Members Meeting took place Nov 14, and leadership changes were formalized. Michael Mercadante of Main Street Design officially became the new International Board President, succeeding David Willrich of DJ Willrich Ltd. The TEA Western North America Division also has a new Board President - Shannon Martin of Color Reflections - with Tricia Rodriguez of Mad Systems transitioning out after having completed two one-year terms. Marissa Blake of Shedd Aquarium became the new TEA NextGen Committee Chair, with Arielle Rassel of Acomb Ostendorf and Associates stepping down after several years in the role. SEE FULL LIST OF INCOMING/OUTGOING BOARD MEMBERS. 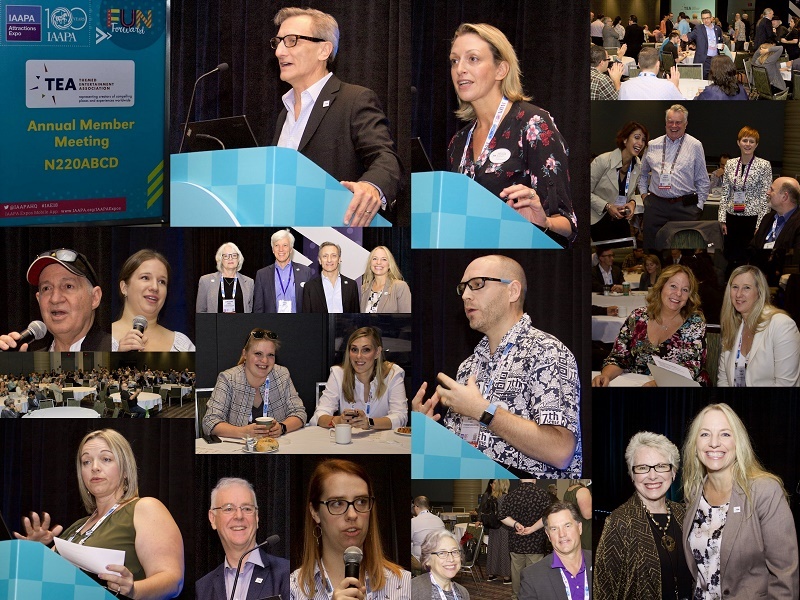 during the 2018 IAAPA Expo. The mixer was a huge success with some 2,000 people attending. As newly installed TEA International Board President, Michael Mercadante addressed the members meeting, followed by TEA COO Jennie Nevin. They shared some high points of the current status of the association. TEA is in good condition fiscally, with steadily increasing membership, a steady output of content, a brimming calendar of events (100 annually) most of them heavily attended and many of them attracting full houses. 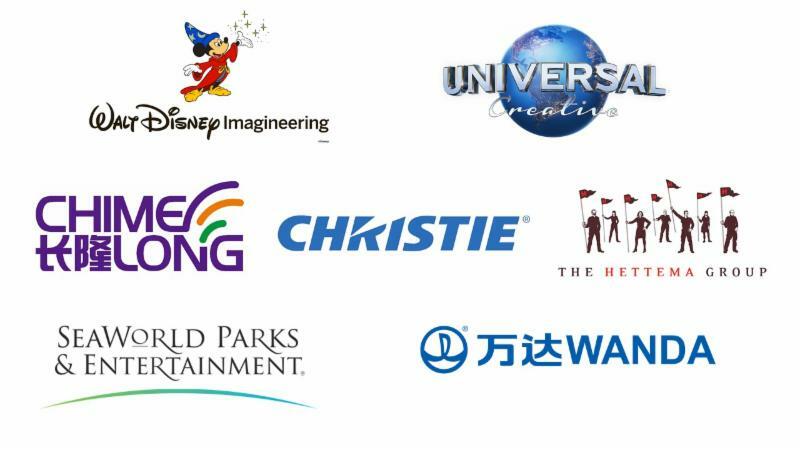 TEA now boasts more than 1,700 member companies worldwide, and within that membership, 51 countries are represented. Other speakers at the well-attended meeting included the TEA Division Board Presidents: Melissa Ruminot of Nassal (Eastern North America), Matt Barton of 7thSense Design (Europe & Middle East), Thomas Megna of Megna Entertainment (Asia Pacific) and Shannon Martin of Color Reflections (Western North America). 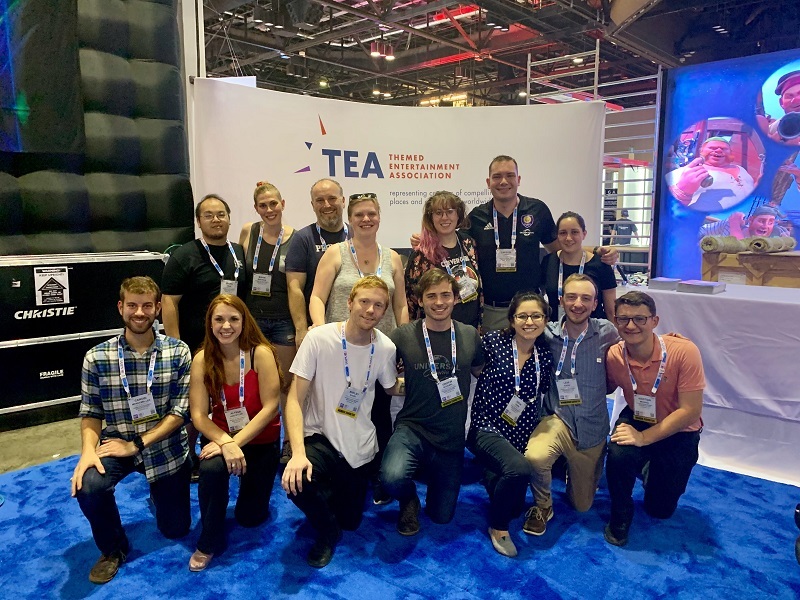 TEA members enjoyed some of the fruits of membership, making the most of hospitality, networking opportunities and refreshments provided at the TEA booth, with two popular mixers: the TEA NextGen Ice Cream Social, and the Barco-sponsored mixer. Many thanks to the generosity of TEA sponsors and volunteers whose support is essential to the success of these and other events. 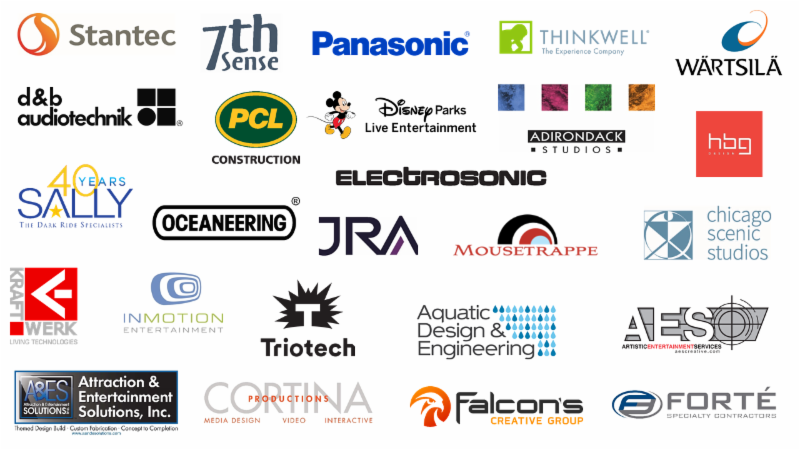 Many thanks to Barco for sponsoring a mixer in the TEA booth at the 2018 IAAPA Expo in Orlando! Master of ceremonies Eric Cantrell encouraged people to mingle and enjoy themselves, and they did.